The picture was taken at the March 2016 Scholars Luncheon. 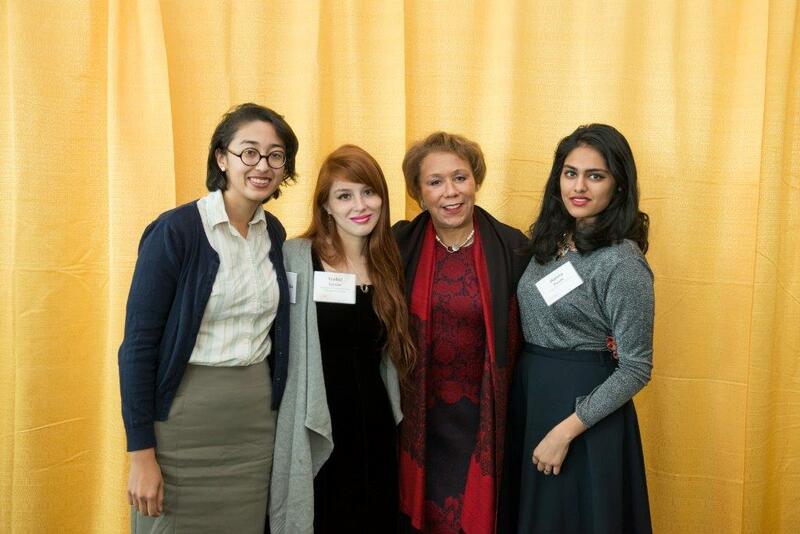 From left to right, Natalie DeNigris (Senior, Physics & Psychology), Isabel Heisler (Senior, Global Studies and Geographic Information Systems Certificate), Mrs. Jacqueline Hrabowski, and Hanna Dasoo (Senior, Global Studies). Photo taken by Marlayna Demond ’11. Since 2003, a scholarship has been awarded to a UMBC student in recognition of the accomplishments and contributions of Jacqueline C. Hrabowski. For 2019-20, one UMBC student (possibly two) will be selected based upon her/his commitment to improving the lives of at-risk urban youth through academic studies and community service activities. Recipients will receive $2,000 for the academic year, $1,000 each semester. Malaysia McGinnis, Chemistry Education, B.A. Be a full-time, degree-seeking student at UMBC. Be a currently enrolled freshman – in 2019-20, he/she would be a sophomore. Demonstrate a minimum 3.0 cumulative GPA. A 500-word essay explaining actions that she/he has participated in that have contributed to improving the lives of Baltimore City youth. Include availability for a potential interview on either Wednesday, March 6th (12-2pm) or Thursday, March 7th (9am-12pm). Deadline to submit applications is Thursday, February 28th at 5 pm. Applications can either be emailed or dropped off in person to The Shriver Center, 1st floor, Public Policy Building, Monday-Friday, 8:30am-5pm. Please make sure all 4 components are included. The selection committee will then immediately review applications. Depending on the number of applicants, the committee will select a few to move forward to interviews on either Wednesday, March 6th (12-2pm) or Thursday, March 7th (9am-12pm). This will be a quick turnaround. From those interviews, a few candidates will be identified for a final round of interviews, tentatively scheduled for Wednesday, March 13th (TBD). Final decisions will be announced by Friday, March 15th (but is subject to change depending on inclement weather and/or schedules). Questions? Contact Lori Hardesty at lhardesty@umbc.edu.